*No, that’s not really us. Apparently this is a big no-no, as there is QUICKSAND BELOW! Hmmm, here we go again! By the time this post is published, I’ll be 4 days into another well known Australian hike, The South Coast Track, famous for bad weather and for being the ‘wettest’ hike in Australia. Coming from Seattle, I’m hoping it’s not going to be that bad… Scratch that- apparently it rains every other day on average. Glad I bought that fancy Mammut rain jacket. The small twin engine plane has been booked from Hobart to Melaleuca airstrip (in the middle of the woods/nowhere), for Friday, November 29th at 9am. At $240/person, it’s pricey, but not really that bad considering it’s the only way to access Melaleuca, and you get to be in a tiny airplane. This is almost the same price as the BUS SERVICE from Lake St. Clair to Cradle Mountain, which was totally outrageous. The Overland Track was just a tester for this next hike, since Tom hadn’t ever spent more than a night or two backpacking. This time, we won’t have huts to rely on in case the weather turns, for cooking, or keeping food away from critters. “The South Coast Track lies entirely within the Southwest National Park and takes you through the heart of over 600 000 hectares of wild, inspiring country. The track is more remote than some other walks in Tasmania, such as the Overland Track. It is recommended that you gain experience on other Tasmanian walking tracks before attempting the South Coast, as you will be a long way from help should you need it. The 85km South Coast Track runs between Melaleuca and Cockle Creek. 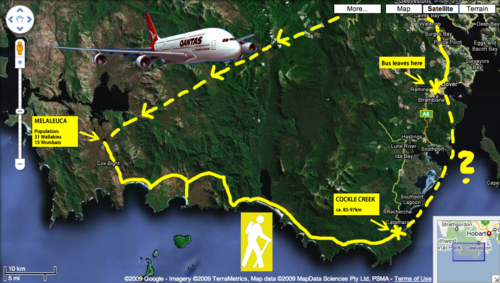 There are no roads to Melaleuca, so walkers must either fly, sail or walk in and out. Most people take about 6 to 8 days to complete the South Coast Track, depending upon time spent enjoying the beaches. Walkers should note that the track surface may be rough and muddy over extended sections. Most people walk during the warmer months from December to March, but walkers must be prepared for cold winds and heavy rain at any time of year. Check the latest weather forecast before starting your trip. There is no formal accommodation at Cockle Creek, Melaleuca or Scotts Peak. Walkers must be self sufficient and able to camp at the start of the track. There is a camping ground at Cockle Creek. Facilities at Melaleuca include two bushwalkers huts, a toilet and a rainwater tank. There is a small shelter at the airstrip at Melaleuca. From the airstrip, a short path leads to the Deny King Memorial Hide, which offers visitors the opportunity to see the highly endangered orange-bellied parrot during the summer months. The hide has plenty of information on this and other birds in the area. You are required to pay a fee and have a pass before entering a National Park (e.g. before flying to Melaleuca). The most convenient pass for these walks is the Backpacker Pass. This pass is valid for all National Parks for a period of two months. If you are unable to purchase this pass in person from park centres and selected retail outlets such as Service Tasmania, please purchase a pass online. Information on park entry fees can be found online. There is no permit or booking system for the Southcoast Track. For your safety please record your trip intentions in the logbook (near the start of your walk). Your entry may save your life should you become lost or overdue. There are booths with log books at Cockle Creek and Melaleuca. Accurate log book information also provides the statistical basis for proper management of the area. Please remember to sign out at the end of your walk. The books are not checked regularly and a search will only be mounted if someone else reports you as being overdue. So, leave details of your trip with a reliable friend or relative. Be sure to advise this person when you have completed your trip. The Southwest National Park is a wilderness area. There are no walkers huts along the South Coast Track. The only huts are at Melaleuca. Very basic accommodation for 20 people is provided in the two huts at Melaleuca. Water and mattresses are available but there are no cooking facilities. A fuel stove is essential. The recommended campsites for the South Coast Track are Cockle Creek, South Cape Rivulet, Granite Beach (east), Surprise Bay, New River Lagoon Boat Crossing, Deadmans Bay, Louisa River, Point Eric and Melaleuca. Walk times given are what the average walker would expect to travel in good conditions. If you are new to bushwalking or the weather conditions deteriorate you can expect to travel for longer times. When crossing the Ironbound Range, note in one day the track goes from sea level to 1000 m above sea level, and back down again. It’s a very full day. Start from the campsite right at the base of the Ironbounds. The South Cape Range is half as high as the Ironbound Range, but equally difficult. It’s a rough and muddy track. Start from the nearest campsite and expect a full day. Note that there’s no creeks for most of the Ironbound Range and the South Cape Range. There is no reliable fresh water at the campsite at New River Lagoon crossing. Most other creeks marked on the map are big enough to be flowing even in the driest time of summer. 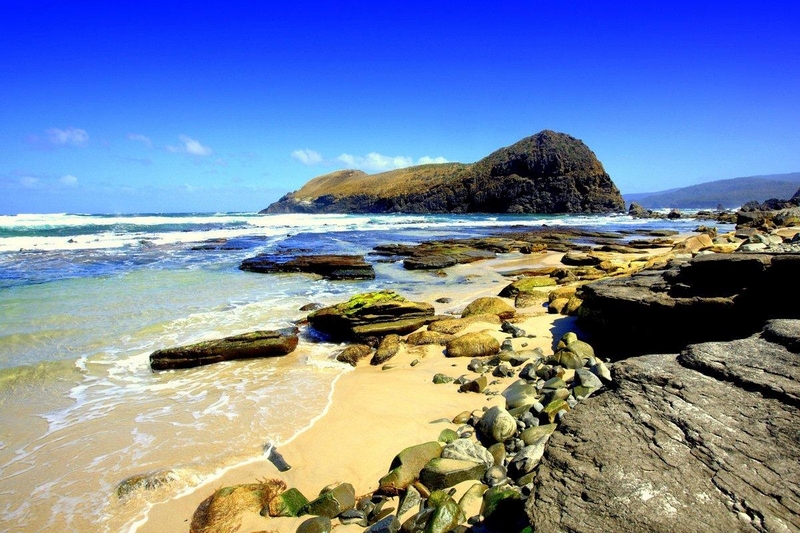 If you want to visit Osmiridium Beach, be aware that the turnoff is not obvious and many people walk past it. Look for a little path meeting the track. At South Cape Bay, there’s no track down to South East Cape (the southernmost point of the continent.) There’s no point leaving the South Coast Track to reach it as it’s an impassable coastline. When walking along narrow or rocky beaches at high tide, beware of large wave swells. There is a water crossing that requires walkers to use small boats at New River Lagoon. Extreme caution is needed when making crossings, particularly in windy weather. You should carry a couple of days extra food to allow for delays. When you row across New River Lagoon you will find a boat on each side. Please leave a boat secured on each side, with oars, for the next person. If you’re alone, you may find the passage difficult as the boats are quite heavy for one person to drag across the sand to secure to the cables. If alone, consider waiting till high tide so there’s less distance to drag the boats. Be aware that the outlet of New River Lagoon may not be as the map shows, as the river shifts its course across the shifting sand dunes. There may be temporary signs to show you a new route. Few places on Earth have water as pristine as in the Tasmanian wilderness. Of course, the water within our national parks is not treated and all natural water sources are subject to local habitat contamination and may not meet health authority guidelines for drinking water. Although the risks to your health are low, authorities suggest it should be treated. Always treat water (e.g. boil for three minutes) where water flow is low and visitor use is high. Beware that what appears to be freshwater on a map may turn out to be brackish if close to the sea. Take special care to keep water supplies clean, particularly around the campsites. Always wash 50 m away from streams and lakes and avoid using soaps and detergents. Don’t throw food scraps into streams or estuaries. There is a composting at Melaleuca. To ensure efficient operation please follow the instructions provided. All other recommended campsites on the South Coast have pit toilets. In areas away from toilets, faecal waste must be buried 100 m away from any watercourses or campsites. Carry a lightweight trowel in your pack, dig a hole 15 cm deep and bury your waste and toilet paper. Cover it well so that animals will not dig it up. Wildfires have damaged parts of the Southwest National Park. Please carry and use a fuel stove. A Fuel Stove Only Area has been declared over the whole of the Ironbound Range due to the sensitive alpine vegetation and along the section of track from Cockle Creek to South Cape Rivulet. Fines can be imposed for lighting fires in these areas. Most campsites in the southwest are on peat soils. A campfire lit on peat can burn down into the soil and remain smouldering for months. The next hot weather can cause a flare up. It is illegal to light fires on peat anywhere in the state. Try to minimise your impact with every step you take. Always walk in the centre of the track and be prepared to walk through the mud – attempting to skirt bogs only makes them bigger and causes more environmental damage. It is also usually quicker to walk straight through. When walking on beaches, please be aware that you are sharing the beach with shore-nesting birds such as the endangered Fairy Tern and the rare Little Tern, as well as other species whose populations are declining. Shorebirds nest from early September to late March. Please walk below the high tide mark. Keep your party size to less than 6 people to minimise social and environmental disturbance. Large groups can be difficult to accommodate at campsites and have greater social and environmental impact. Phytophthora cinnamomi is a fungus that kills many of our native plants. It is known to exist at Melaleuca and other locations. Mud and soil, which is carried on vehicles, boots, gaiters and toilet trowels, helps to spread the disease.To prevent in fecting new areas boots and all gear that comes in contact with the soil should be cleaned of any mud or dirt prior to your walk. You should also wash your boots at each significant stream crossing. If you come across a washdown station please follow the directions. Most of the coast is exposed to cold, wet, southerly winds. Rain falls on average every second day during summer and more often in other seasons. On the South Coast Track, the Ironbound Range rises to 900 m where the weather can change rapidly. A warm sunny day can quickly turn to a day of high winds, hail, sleet and snow – even in summer. Walkers should be fit and prepared for a long days walk (up to 10 hours) as there are no campsites on the Ironbounds. At times of heavy seas and high tides, some rocky sections of the South Coast Track can be unexpectedly inundated by ocean waves. Particular care needs to be taken at Granite Beach and the unnamed bluff on the eastern beach at Cox Bight. Spotting a snake can be common along the South Coast track. Snakes are shy animals and will usually get out of a walker’s way rather than attack. Wearing sturdy boots and a pair of gaiters will protect your lower legs. Most bites occur when people try to kill snakes (this is illegal). If a bite occurs keep the person at rest, lying down. Do not wash or cut the bitten area. Apply a firm pressure bandage (not a tourniquet) from the bite site, all the way down the limb then back up the limb. Death from snakebite is very uncommon. You do not need to catch or identify the snake as the same antivenom is used for all snake bites. Updates to come! We should be back in civilization by Dec. 6th or 7th. Wish us LUCK!